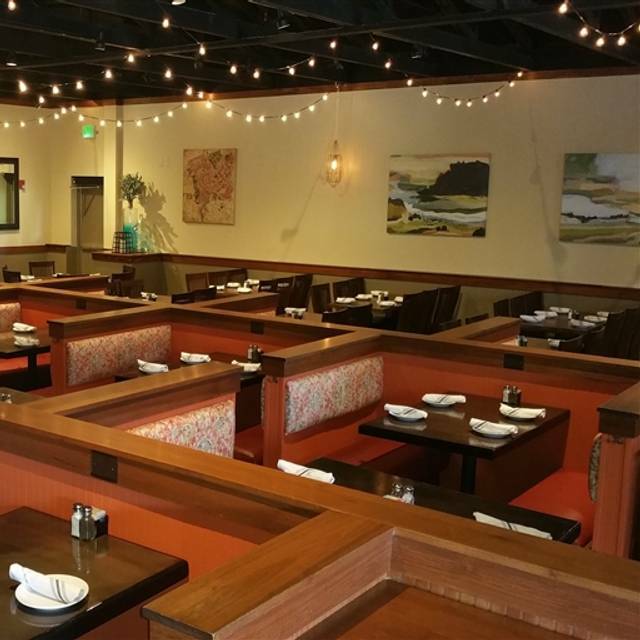 You must make reservations at least 5 minutes in advance of the time at Basta Pasta - Perry Hall. Welcome to Basta Pasta Italian Kitchen & Bar! Our local family of restaurants started in 2004, with a philosophy of becoming the ultimate expression of what an Italian casual dining experience should be. Our Perry Hall location features a blend of exquisite Italian food and seafood, wine and spirits in casual elegance with remarkable service. I view this restaurant as a sort of upscale Olive Garden. The entrees are more authentic and there are more diverse selections than you typically find at your local OG, but the place still had a chain restaurant feel to it. The food was really good though and they are generous with their portions (food and drinks). The service was only fair as they were understaffed but the waitstaff's teamwork was solid. My wife is not really big on Italian cuisine, so the restaurant has to be really stellar for her to want to go back and I don't think this place did it for her. Crab cake was wonderful. Great value for price. Service was very good and our waitress was friendly. The food was fabulous and the service even topped that, overall one of the best dining experience ever. We have gone to the Basta Pasta in Fallston but never Perry hall. We met friends there for dinner and had a great meal! Our server was GREAT! She really made our experience there wonderful! She was so friendly, on top of everything, made recommendations and was even pregnant and still full of energy and great at her job! Our meals were all really good! We will be back! Our server was excellent, good was too. Will definitely go again. The timing was quiet for a 1:15pm reservation for four of us. The service was friendly and attentive to every detail. The food was spot on for flavor and comfort. Thanks. We'll all be back! My pasta was amazing as well as the salad and appetizers. My husband ordered a Filet cooked medium and came out well done and burnt also the potatoes or cold. The seafood pasta combinations were scrumptious, the salad, bread, and soups were excellent. And the portions were generous. Prices were very reasonable. Quiet enough to enjoy conversation with dinner. Highly recommended. It was our first visit and we were very disappointed. They lost the ticket for our child’s meal. We waited close to 50 minutes for our food. Even the salad and bread took forever. The grilled cheese looked like it wasn’t grilled; bread was white. Crab dip had a sour taste. Best part was the veal Marsala. We won’t be rushing back. We were disappointed in our table and the manager moved us to a more comfortable booth. The waitress was very pleasant and attentive to our needs. The meal was delicious and the drinks were generous. It proved to be a very relaxing evening. Really need to do something with the dining room. Too bright, very open. Has the feel of a high school cafeteria. Booths in the middle of the room next to each other, other diners leaning over asking us what we got for dinner. Had a great time. Food was delicious and portions were very generous. Will definitely return and come with friends. Date Night with my wife. Food was plentiful, service was superb. Wrong food came out the first time. Took a long time to get drinks. Waitress was very nice but seemed overwhelmed with the amount of tables. The meal was great! Lots of choices on the menu, too. Our server was excellent and took very good care of us! This is my third visit to Basta Pasta, and it just keeps getting better and better! I'll be back again soon! Salad and bread were very good. Eggplant parm was heavily breaded, too heavy for my taste. Overall, meal was good. We brought a two month old grand daughter with us to celebrate New Years. The staff was very accommodating and gracious to entertain. Recommend for future dinning experience! Good food and great service. Our server Paige was very friendly and helpful. Basta Pasta never disappoints! Huge portions, delicious food, beautifully presented coupled with friendly attentive servers - checks every box for a family meal - even on Christmas Eve. Crab Cakes are a tasty work of art, and my husband believes BP serves the most delicious broccoli he's ever had! The Chicken Chesapeake is topped with a full size crab cake of its own and packs up well to go home for a second next-day meal. The home-made cheese cake this night was the absolute creamiest ever - almost a whipped consistency, it was so light. Left-overs are affectionately boxed up for you (like Mama used to do) at the end of the meal - just like a family dinner should be! We had a party of 12 and everyone enjoyed their meal. Great place, great service. Food was delicious and generous portions. Our waiter was very attentive and helpful with our special requests. Basra pasta is my favorite restaurant. I love the food but you need to keep pumpkin cheesecake more available in the fall. We had a party of 6 well-traveled friends for dinner. Everyone commented on how good the food was. Amazing experience at Basta Pasta in Perry Hall! Our waitress was awesome and efficient! Will definitely come back! They cook your food to order it actually come out hot... It was great.. i will be going back.. The service was professional and attentive. The food was well prepared with great flavor and presentation. Always a great value with their generous portions. Service was great too. A real find. Consistent, quality food. We have not been back to the national chains since we first came here. Great value, portion size is huge allowing us to have a second dinner to take home. I love their food and that location is great. The waitress was very nice as well. The food at Basta Pasta is always consistently good. Portions are most generous. I've eaten here and at the Timonium location several times. The food is always great. Have to give a shout out this time to our waiter Tom. He was ever present filling up our soda, iced teas, water. In addition he also make sure there was enough salad and bread. When only 2 ordered dessert, he brought plates for all and even brought 2 additional desserts to share. And he was even willing to give us all separate checks. We usually go on Wednesdays for the Prime Rib special. Great deal. Always delivers a nice cut of meat.